Poor Garrett. I have roped him in to another one of my crazy schemes! I am lucky he is such a good sport. Let me tell you all about it so you can sympathize with him — but keep in mind I cook him really delicious food all the time so it’s not like I only bring the crazy to this relationship! 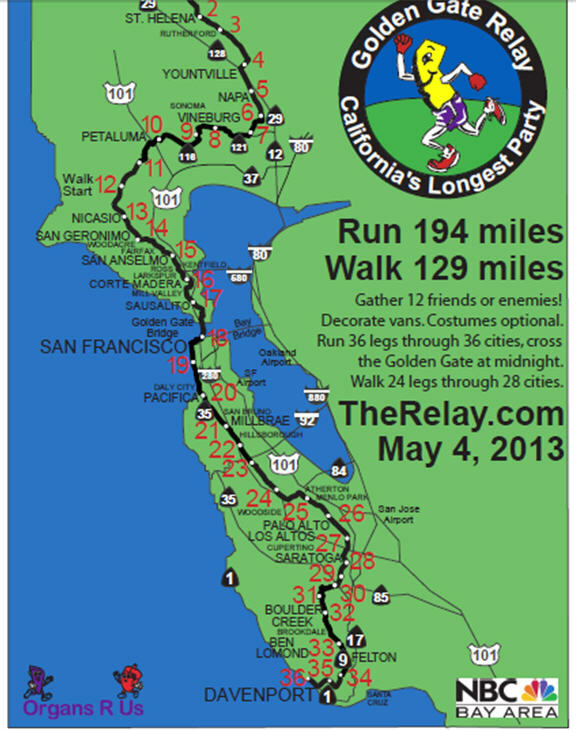 If you’ve never heard of The Relay it is a 200 mile run done in 12 person teams that starts up in Calistoga and ends in the Santa Cruz Mountains. The race is broken into 36 legs and each team member runs 3 legs. We are doing this May 4-5 with 10 other members at our gym and we will get to run through 36 cities including the Napa Valley, Marin County, a night run over the Golden Gate Bridge, through the South Bay and finishing in the Santa Cruz mountains. Sounds a little nutso, yes? But also — pretty freaking fun, right? Oh how my perception of fun has changed in the last few years! The total mileage you run depends on the leg that you are assigned but it ranges anywhere from 12.6 miles to 18.5 miles, with varying levels of difficulty in each course. For example just because a leg has less mileage doesn’t mean that it is easier as some of lower mileage runs are straight up hill or in particularly windy areas. There are definitely many things to consider with respect to your own capabilities and the strengths of your team. I’ll be the first to admit that I was a little nervous coming into this as a complete novice and not a very strong runner, but luckily my team is not concerned with competitiveness and really just concerned with having fun. Obviously it’s the only way I would do it! 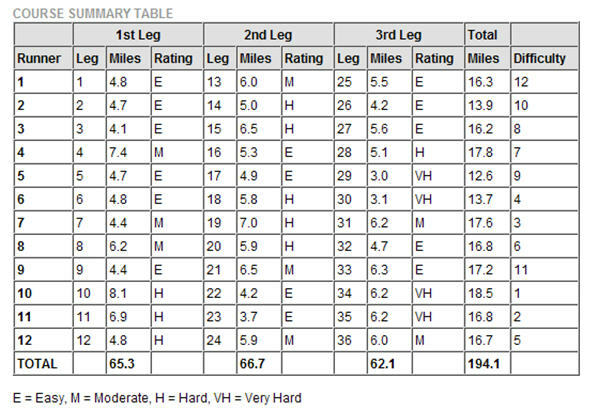 For some perspective, here is how all the legs shake out – and I love how it ranks it by level of difficulty. Initially I felt fairly comfortable with the mileage. Since I had completed a half marathon (damn it still feels good to say that) I knew that I could run 13-ish miles comfortably (Comfortably! Ha! That’s funny.) But it definitely gets dicier when you consider that challenge of this event is that you don’t run it all at once. The legs are broken up and in between you are either sitting in a van for hours, chilling at someone’s house, or trying to get some sleep. (PS — Do you live on that route? Want to host Garrett and I for a nap? ha) So training for this will definitely involve more than being able to run 16 miles in a row. It’s more accurate to say, can you wake up and run 6 miles, go to work, come home and run 6 miles and then get up again the next morning and run another few miles. And THAT, is a whole other beast. But one I’m excited to train for. Oh how cute, to think that I would actually have one already. BAHAHAHAHA. I do not. But I will tell you my approach for now. The first thing is, I’m not trying to be a hero or anything. I am pretty up front that I would like an easy route. Yes running over the Golden Gate sounds nice, but not if I have to spend the last 3 miles of my race running straight up hill. I’m smart enough to know that I’m not ready for that yet. So – easy route, yes please! Second, I am going to spend the next couple of months really working on my speed. I don’t know how much this will really affect my overall experience, but I would like to be running faster, more consistently before I start doing distance training etc. Third, I am basically accepting all of the help from anyone who is willing to offer it. Our friend Matt (hi Matt!) has run this race multiple times and he has given us some great insight. My friend Lesley (hi Lesley!) is doing all sorts of running this year and so we are going to hook up to do some running together and she is mucho experienced and also willing to help mentor me a little bit. I LOVE MENTORS! I AM A MENTOR NERD! Plus, all of my teammates are going to be doing some group training so I look forward to enjoying the camaraderie and skills that this will bring with it. So that’s the scoop! And since I’ll be talking more about it and my running adventures in the coming months I’m sure I just thought I’d give you a little background. Have you ever done a race like this? Have any advice? Think I’m a total nutjob? Talk to me. I have never run THE RELAY but I once did a marathon relay with 6 people. We each took a leg. And that was enough for me Racing makes me crazy, so doing this kind of race would be too much. I would not sleep, I would not do well at this. And I am a one shot runner. Let me have time off and then ask me again and it will get ugly. My plan is to try to do a mud run this year. I had an ankle thing for about a year so I wasn’t really running, so I missed out on some mud runs that sounded like fun last year. My ankle is cooperating now, so this might be the year. K-ster would never join me in a relay like that. He might think about do a mud run but I’m not even sure about that. It’s fun to hear how excited you are. I do not get excited about running at all. I started in 2001 and everyone says I will eventually love it. Yeah, I don’t think so. I will admit that when I was sidelined, I did kind of wish I was able to run because a)it’s more convenient than driving to the gym and b) my body is never the same when I take running out of my exercise routine. However, now that I can run again, I’m not burning up any pavement, so I think it was a classic case of wanting what I couldn’t have! Garrett doesn’t like to run “for fun” (where I’m more inclined to do so) but he does like to train for specific goals so I think that is why he was mostly agreeable. The mud runs look super fun, hope you get to do one! I was on the support team for this relay 6/7 years ago and it is a long relay. That said I live in Los Altos if your team needs a place to crash/shower/ recharge during the race. I just love you and your blog and am happy to help. Good luck training!! Thanks Meredith! I’ll keep ya posted. My aparatment is open to any and all. Not sure what the route through SF is but I’m in North Beach and have the world’s most comfortable couch! We are on the route and offer beds snacks and encouragement. I will put may4 on my calendar. Is it all one day? Aw thanks, Erica! I’m not quite sure of all the logistics, but yeah it is over 24 hours so not sure when we will be where but I will keep you posted. Excited to see ya at brunch in March and glad you are having all sorts of fun Nor Cal adventures! My hubby did this last summer in Washington! He had run a few half Marathons before. He said this pushed him farther than he had been pushed before! He is also is already signed up again for this year!! Yeah that is pretty much what everyone says “That was awful! When can we do it again?” haha Those are My People! We did a similar relay called the Wild West Relay – little over 200 miles from Ft. Collins, CO through a little bit of WY and ending in Steamboat Springs. Let’s just say – lots of climbing and lots of elevation. 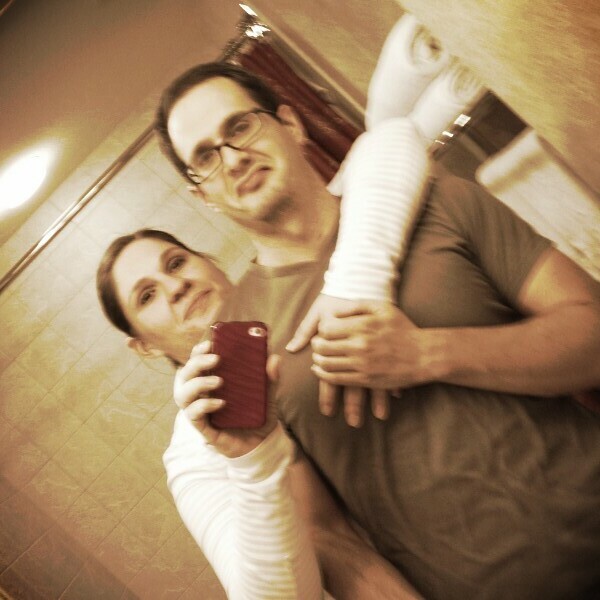 Oh & it was on our 1st anniversary It is sooo fun. My favorite leg was the 2am in the middle of nowhere where you’re just following the little bobbing light of the runner in front of you. I’m SO excited for you guys! When Dave and I lived in the Bay area, we were not yet runners. We had friends who did the relay, and we thought they were a little nutty. Fast forward 15 years, and we are SO envious. I’ve yet to run in the Marin Headlands or on the GG Bridge, and THAT NEEDS TO HAPPEN. Also, the Dipsea Trail. OMG. So have EVER SO MUCH fun and know that when we come to CA for a visit, you and Garrett are joining us for a fun run, followed by an epic brunch. Love to you guys! If I had a life list, Dipsea would be on it. And running + epic brunch? We are ALWAYS available for that! I live in Santa Cruz! Too bad that’s your final destination otherwise I’d say come crash at my place between legs, but I have a hunch you and Garrett will find a nice room to recover in I know a lot of people stay at the Dream Inn right on the beach! I can’t wait to read all about your training. That does sound fun. It also definitely sounds harder than running all the miles in a row. Mental toughness ahoy! So many people recommended Immodium when I ran the half and I was like “Hmmm…I have an iron stomach. Not too worried.” And then the morning of came and I was literally RIPPING THROUGH OUR CABINETS cursing myself for not being more prepared. I ended up finding an old gag-gift basket my mom gave Garrett for his 30th bday that had “old people stuff” in it like Preparation H and Ben Gay and LUCKILY some off brand type Pepto. NECTAR OF THE GODS, is all I’m saying. Will not make that mistake again. You are a nutjob, but only in the finest ways..Go girl go, and when you bring Garrett to Colorado you can run up Trail Ridge (highest paved continous road in the US, highest point is 12,183 ft above sea level)for fun…..
Relay! Relay! Relay! Thanks for the shoutout! The Relay is a total exercise passion of mine. There is no end in sight for our team and hopefully it stays that way and becomes a staple of your year going forward. It’s way too much fun. We aren’t a competitive team per se either, just each person is competitive with themselves to throw down good times. The right team makes all the difference because by 3am you either are all laughing with each other at how ridiculous you are or nerves are frayed and people will start throwing bagels at each other Sunday morning (true story from an iteration of my team before I was on it). Anyhow, I’m totally in if you guys wanna do any training runs or races heading in, I’ll come to you guys, you come to me whatever. My training schedule this year has changed from years past, I’m not just going to do a static distance increase until I get to 10k. Im doing one long run, one speed run, one trail/hill run (found a great 300 ft hill ) per week with a 4th mystery run whatever I’m feeling. I’ve loved it so far in the 6ish weeks I’ve done it. Better than the run 4.25 miles 3-4 times a week and then the next week run 4.75 miles 3-4 times a week. I’ve felt a lot stronger in all my runs doing it this way. Lastly, I’m experimenting with compression calf sleeves this year (just ordered them) because I’m hell bent on doing all three legs in my VFFs instead of just one and I’ve heard these do wonders in recovery time (which of course is the biggest issue during the relay). So i dont know if you get calf soreness as you ramp up your training from running in your minimuses but Ill imagine you do. I’ll let you know how they work. They may be the best 40$ investment ever. I agreed to run in the Ragnar Del Sol here in Arizona and (yikes!) it’s in a month. I haven’t done as much training as I have for races like 1/2 marathons in the past. Instead, I’m trying to get in trail runs for the hills and such, some sprinting, my usual crossfit workouts, and one day a week where I do two runs. We’ll see how it goes. I’m a bit more nervous about how I’ll fuel these shenanigans. I’m guessing I’ll bring along nuts, dried fruit, salami, hard boiled eggs, sweet potato chips, etc. But I am worried about how much to eat when. Burritos. Fuel with Burritos. heh Just kidding. I will be totally interested in how you do fuel though so keep me posted, will ya? I would love to fuel my run with burritos but um, I don’t think my body nor my van-mates would appreciate that very much! I’m thinking deli meats, dried fruit, veggies, sweet potato chips, etc. I’ll keep ya posted! OMG this sounds crazy to me!! But that’s because I’ve only run 5ks and, even then, I was tired for days afterwards. So I can’t imagine this, but it does sound like a whole lot of fun… I’m looking forward to hearing all about it! Yay! That sounds like fun. You should take a look at the CrossFit Endurance website. I just used the endurance method to train for the 1/2 I did on Sunday and it made the training much more bearable. There’s also some good drills for running that might help you too! Good luck! 1) It is AMAZING. You are going to have so much fun. 2) The running honestly isn’t as hard as you will think. I ended up running my fastest paces ever in those runs. 3) It’s the exhaustion that I thought was harder. At most you will get 5 or 6 hours of sleep during the 36 or so hours it takes. Between the traveling to/from your rest stops and settling in, there’s just not a whole lot of time left to sleep. Know going into it you’ll be tried and a little cranky and figure out how to deal with that. I also got super sick (like sickest I’ve been in years) a few days after. REST UP when you’re done. 4) Plan where you can stop and get hot food after your legs on your way to your rest stop. We had lots of snacks and sandwiches (pre-Paleo, but in all honesty if I was doing this now I’d probably still eat sandwiches), but having hot food after completing a leg was wonderful. I’m totally thinking about the burrito I ate right now… 2.5 years later I can still taste it! 4) Have fun with it. Our van had a blast (and it was all co-workers I didn’t know all that well at the start). I will never forget sitting in Santa Cruz, wrapped in snuggies, drinking Coors Light (don’t judge) waiting for van 2 to come across the finish line. Such fun memories. I just left a super (too?) long comment about my experience, which seems to have been eaten by the internet, so here’s all I really should have said from the beginning. It’s an amazing, awesome experience, and that’s coming from someone who did it with co-workers. Go into it knowing you will get super tired and cranky and make a game plan for dealing with that. Plan for hot food on your way to you rest spots – you’ll really want it. REST like crazy after (I got so so sick the week after). Have fun and don’t take the training too crazy. I actually didn’t think the running was as hard as dealing with the sleep deprivation. Jealous! You’re obviously going to rock this because you are you! And the Santa Cruz mountains? That’s my old stomping grounds. A majestic place of beauty to end a race. The final leg I run is in Ben Lomond. Despite loving the SC area I can’t remember, for the life of me what the deal is with that town. Any insight? Hi Holly! I’ve been reading your blog for a few months now, and I have to say that you’re a big inspiration to me. Your blog is so fun to read too. Anyway! Your race sounds amazing! I’m doing a similar race in Utah this summer, the Wasatch Back Ragnar Relay. I’m so excited and nervous at the same time. I’m not a runner by anyone’s stretch of imagination. I’ve never done a race or even run a consecutive mile in maybe 15 years. I’ve always said that you should only run if you’re being chased by bad guys or have to get to a bathroom quick. But I suppose there’s always room to adapt new philosophies. I’m glad your race is before mine and that I’ll get to see how your get ready for it and how it goes! Good luck! Thanks for that Kris! I think all the Ragnar Relays look awesome and was wondering how much coordination would be involved in trying to rope a bunch of my friends together to do one when my CrossFit buddy suggested we run the one we are running. SCORE! It was like divine intervention…I couldn’t say no. Happy training! Ben Lomond is in the woods up near Scots Valley and Felton. Forest and rivers and such. There is an old hotel/restaurant there that is rumored to be haunted!